This is an individual tournament, open to all players. 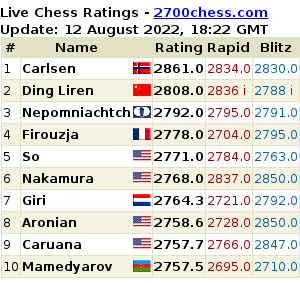 There are two groups of play: Open category for all players, and Challenger category for players rated below 2100 or unrated (ratings based on FIDE or Thai ELO ratings – other national ratings will be validated by the organizer). When registering, players must indicate in which group they wish to play. FIDE (International Chess Federation) rules and regulations shall apply. Results will be sent for FIDE rating calculations, and are eligeble for FIDE title norms. Both groups will be played using the Swiss System, with 9 rounds for Open, and 7 rounds for Challenger. For the pairings, a Swiss Manager program will be used. The matches shall be conducted according to the schedule, which will be made known to the respective players before the start of the tournament. Each player is accorded with a time control of 90 minutes plus 30 seconds per move. Five minutes before the games start, the Chief Arbiter shall make the announcement accordingly. If any player is not present within an hour after the game is started, he shall lose by default. All mobile phones in the playing hall shall be switched off while games are in progress, any violation shall result in loss of game. * Entry fee for ‘Winner-takes-all’ blitz tournament is Baht 100 (GMs free). Prizes: Thailand Open prizes are for 1-10 ranks and 5 best Thais, and certificates for best 3 best juniors and best lady. 1st prize will be Baht 100,000. BCC Challenger has prizes for 1-5 with 1st prize Baht 15,000, and certificates for 3 Best Juniors and best Lady. Please note: 5% tax will be deducted from prize money. All prizes are in Thai Baht. Arbiters. Chief Arbiter IA Markku Kosonen (Finland), Deputy Chief Arbiter IA Panupand Vijjuprabha. In the event of dispute the Chief Arbiter’s decision is final. The above rates are inclusive of service charge, VAT and breakfast. For accommodation reservations at the venue, Dusit Thani Pattaya, please complete the booking form. Entry Fees. Open: Baht 2,800. Challenger: 1,000 Baht. (1 USD is approx. 30 Baht, 1 Euro is approx. 40 Baht). All tournament fees must be paid before the start of the first round and can be done online via our secure PayPal payment gateway here. Registration. The deadline for registration is March 10, 2010, after which a late registration fee of 500 Baht will be added. Organizers reserve the right to refuse or decline late registrations. Please complete the online registration form. The organizer will confirm your registration by e-mail. If you do not get a reply within a week, please send a reminder to bangkokchess@gmail.com. Players must indicate in which group (Open or Challenger) they would like to participate. Conditions for Titled Players. Tournament fees are waived for GMs, WGMs, IMs, WIMs and 2500+ rated players (according official FIDE March 2011 rating list). First 15 GMs to register will get complimentary accommodation (room & breakfast in twin sharing with another GM for 7 nights). Complimentary room reservation is confirmed after receiving deposit transfer of Euro 50. This received deposit will be fully returned after check-in to hotel. Please contact organizer (bangkokchess@gmail.com) for inquiries. Tournament results and parings will be updated daily to chess-results.com.